The Cord Collar solves two common cord problems with one simple, colorful solution. Protect cables and help prevent fraying where cords bend the most by reinforcing cable ends with these strong, durable covers. As an added bonus, these colorful cable protectors help identify and distinguish individual cords. This stainless steel FlipOut Handle + Stand phone handle and stand folds flat, creates a secure grip, and lets you easily view your phone hands-free in both landscape and portrait modes. The low-profile design slides into pockets without snagging, but flips out to create a convenient handle or stand. It's the little details that set this high-quality phone accessory apart from anything else on the market. With strong and secure 3M VHB adhesive, high-quality construction, and a design engineered to work equally as well as a stand as it does as a handle. Plus, the unique articulation of the FlipOut lets you use it flat, folded out, fully-extended, or anywhere in between. The beauty of the Steelie Dash Mount Kit Plus is in its simplicity. This magnetic two piece ball-and-socket mounting system attaches to your dashboard using a strong, removable 3M® VHB® adhesive. The Magnetic Phone Socket Plus features a powerful neodymium magnet and offers twice the holding power as our standard-sized magnetic socket making it perfect for both standard and plus-sized devices with or without a case. With two convenient ways to attach your magnet to your device, you can decide whether to keep the phone-safe magnet on your phone all the time or use the MultiStick™ Adapter which allows you to remove and re-stick the Magnetic Phone Socket Plus multiple times. The Steelie Magnetic Phone Socket Plus contains a silicone center, creating a smooth glide and firm grip that allows you to easily adjust the phone for the perfect viewing angle. A great bonus feature to this product is its versatility. With the Steelie Magnetic Phone Socket Plus you can easily attach your phone to other magnetic surfaces like refrigerator doors, toolboxes, and our entire ecosystem of Steelie Magnetic Mounts. *The Steelie Magnetic Phone Socket Plus contains a strong magnet. This magnet will NOT damage your mobile device; however, do not place it near magnetically sensitive objects such as credit cards, pacemakers, or computer hard drives. Nite Ize assumes no liability for damage to such products. Includes Dash Mount, Magnetic Phone Socket Plus, one replacement 3M® VHB® adhesive pad for Dash Mount, one replacement 3M® VHB® adhesive pad for Magnetic Phone Socket Plus, MultiStick Adapter, and installation kit. Safely communicate and navigate hands-free when you hit the road with the Steelie Windshield Mount Kit Plus. 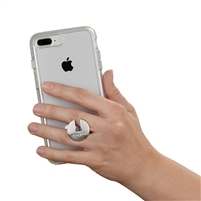 The Magnetic Phone Socket Plus features a powerful neodymium magnet and offers twice the holding power as our Magnetic Phone Socket making it perfect for both standard and plus-sized devices, with or without a case. The Steelie Magnetic Phone Socket contains a silicone center, creating a smooth glide and firm grip when connected to the Steelie Ball that allows you to easily rotate the phone from portrait to landscape. As an added bonus, with the Magnetic Phone Socket Plus on your phone, you will be able to connect it magnetically to other convenient surfaces like your refrigerator, tool box, or other Steelie mounts. With two convenient ways to attach the Magnetic Phone Socket Plus to your device, you can decide whether to keep the phone-safe magnet on your phone all the time or use the MultiStick Adapter, which allows you to remove and re-stick the Magnetic Phone Socket Plus multiple times. The Windshield Mount features an adjustable aluminum arm and suspended Steelie ball design. The adjustable arm can be easily secured to an ideal angle, while the round shape of the Steelie ball allows for endless viewing angles of your phone. The patented suction cup design features an easy-to-use locking lever that engages the suction cup for ultimate holding power to your windshield. It also acts as a quick release lever when you want to remove it.